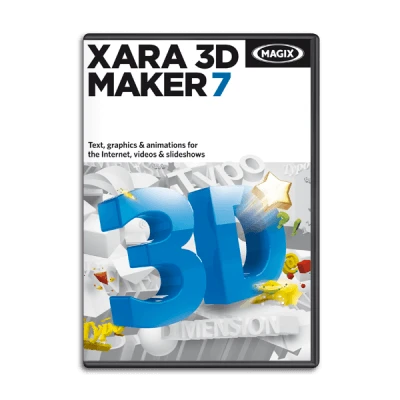 Use MAGIX 3D Maker 7 with your own texts, included form templates, or freely importable graphics to create impressive 3D titles, objects, and animations. Choose from over 700 templates, more than 400 textures and 33 different edge styles. Makes shapes look, for example, as if they were chiseled out of stone. In order to avoid being distracted by fill colors and textures, you can also display texts and objects as a lattice model. Animate how the same object fades in and out separately from each other. For example, your title appears in the background and then flies towards the viewer and disappears off to the right. Freely move 3D objects in any direction. And change the speed of movement for any direction as well. Note: The program's internal online services and the online update require an Internet connection. For copyright reasons, MPEG-4, MPEG-2, and Dolby®Digital Stereo must first be activated for free. You are required to install Windows Media® Player version 10 or higher for MP3 export.